The Best Pumpkin Pie Recipe – Two secret ingredients that improve the flavor and texture! Oh and by the way, it’s a slab pie, much easier and fun to make! I have not always been a pumpkin pie lover. Around the holidays, when other family members were reaching for the pumpkin pie, I would likely go for chocolate or apple pie. To me, pumpkin pie was dense and bland. One Thanksgiving I decided to try to make a pumpkin pie that I would enjoy… Something lighter in texture with a bit more punch. After quite a few test runs, I found that just a couple minor alterations created what I considered the best pumpkin pie. One that didn’t even need whipped cream to make it worthwhile! That’s where the secret ingredients come into play for today’s Secret Ingredient Pumpkin Pie Recipe. This secret ingredient amplifies the earthy pumpkin flavor in a major way. Instead of using traditional pumpkin pie spices, I added Chinese Five Spice, a blend of cinnamon, cloves, fennel, star anise, and szechwan peppercorns. The cinnamon and cloves provide a touch of tradition, while the fennel, star anise, and szechwan peppers add a bit of pop! Chinese Five Spice is the perfect complement to this pumpkin pie recipe. Secret ingredient #2 easily fluffs-up the texture of pumpkin pie. 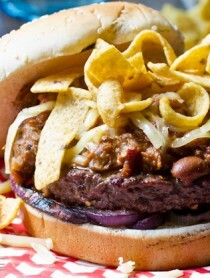 This is done by adding cream cheese to the mix. Not so much cream cheese that you end up with a pumpkin cheesecake, mind you. Just enough. 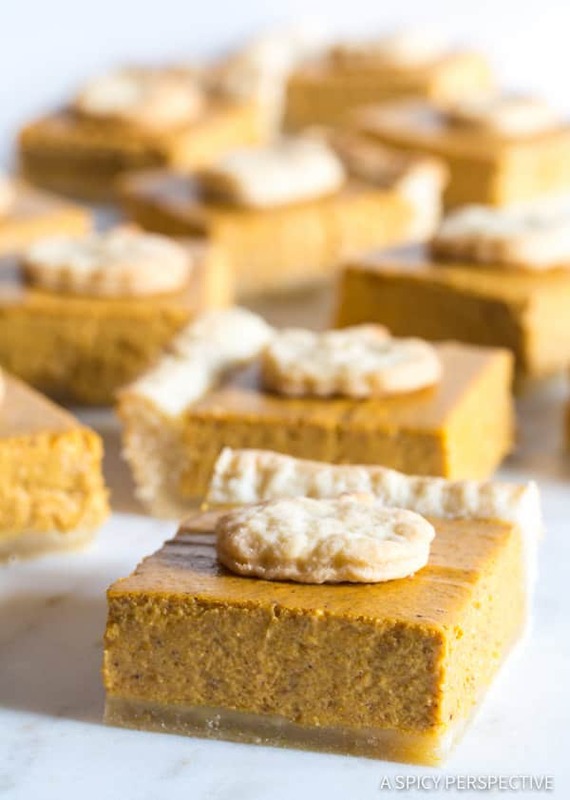 The cream cheese gives this Secret Ingredient Perfect Pumpkin Pie Recipe an ultra luxurious texture that is hard to resist. 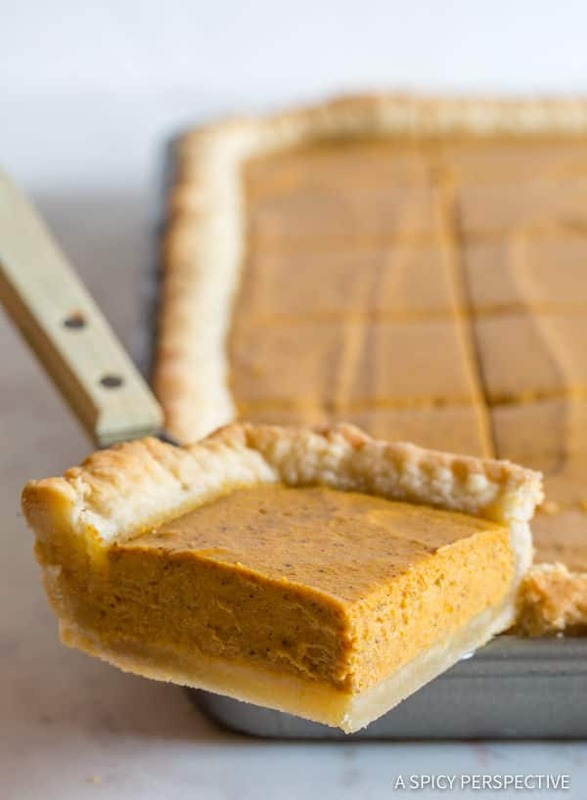 Instead of making classic round pies, this Pumpkin Pie Recipe makes one large shallow rectangular pie also know as a Slab Pie. A shallow cookie sheet would be the perfect pan for this recipe. 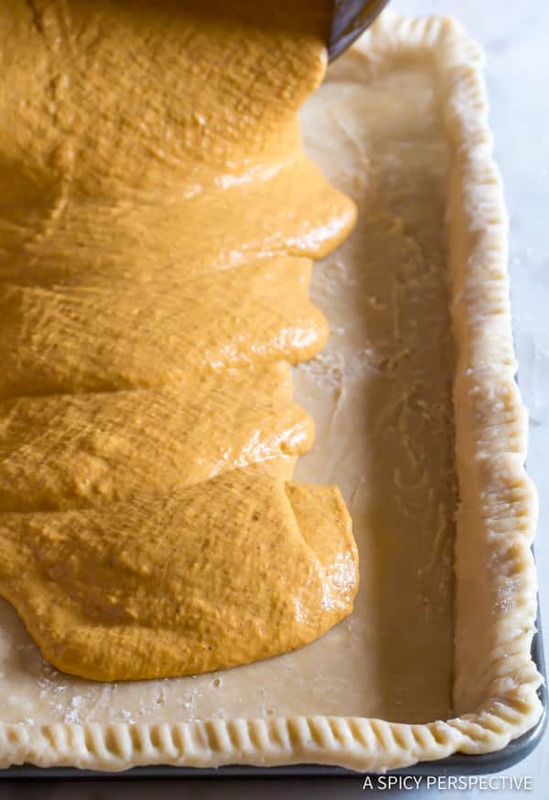 Slab pies take less time to bake than traditional pumpkin pie recipes. They take less time to cool as well. Slab pies are easier to cut. And easier to lift out of the pan without breaking the crust. You get a better crust-to-filling ratio, in my opinion. One slab pie can feed a crowd! Our Secret Ingredient Perfect Pumpkin Pie Recipe makes 24 servings, so it’s perfect for parties! You could also cut smaller or larger pie pieces if you wanted a smaller or larger snack! The smaller you cut them the more servings you’ll have and the fewer calories. Just sayin’. What If I Want To Make This Pumpkin Pie Recipe In Normal Round Pie Dishes? You can totally do this! This recipe would make two 9 inch deep-dish pies. Make sure to bake it longer since the filling is thicker in the pans… Approximately 45-60 minutes. 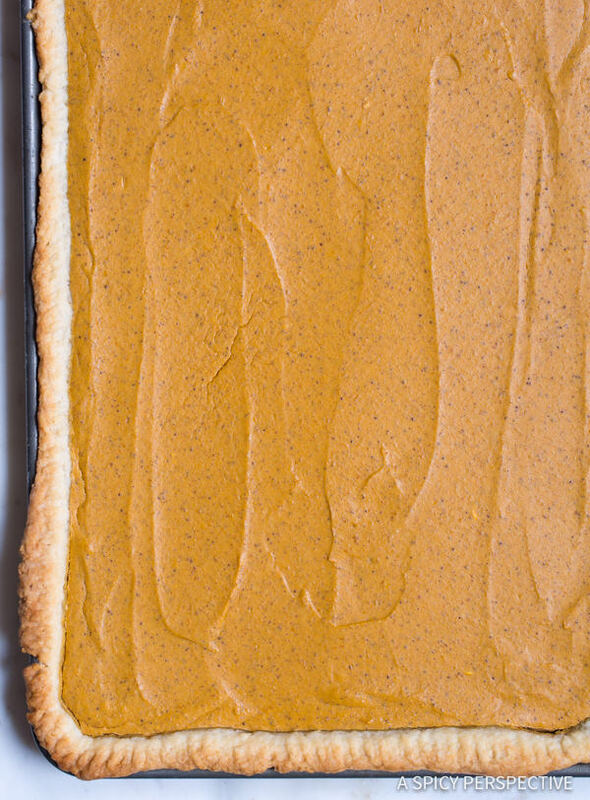 If you’ve never been a big fan of pumpkin pie, give this slab pie a try. I think you’ll find the slight changes are just enough to make you a convert! See the recipe card below for how to make the Best Pumpkin Pie Recipe. Enjoy! The Best Pumpkin Pie Recipe is due to two secret ingredients that improve the flavor and texture! Oh and by the way, it's a slab pie, much easier and fun! Preheat the oven to 375 degrees F. For the pie crust: In a food processor add the flour, sugar, and salt. Pulse to combine. Then cut the cold butter and shortening into cubes and place in the food processor. Pulse again until the mixture resembles small peas. Add 2/3 cup ice cold amaretto and pulse again. If the dough looks too dry add 1-2 more tablespoons and pulse. Dump the dough out onto a piece of plastic wrap. Press into a rectangle shape and wrap well. Refrigerate for at least 30 minutes. Meanwhile, use an electric mixer to beat the cream cheese on high until light and fluffy. 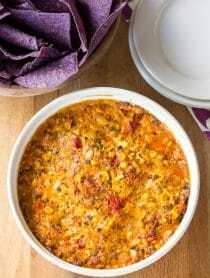 Scrape the bowl and add a few spoonfuls of pumpkin puree and beat again. Add the remaining pumpkin puree little by little, as the mixture beats, to ensure the mixture comes together without clumps of cream cheese. Add in the brown sugar, followed by the egg, cream, Chinese Five Spice, and salt. Scrape the bowl again and beat until smooth. Take the dough out of the refrigerator. Cut 25% of the dough off one end. Wrap the smaller piece of dough and place back in the fridge. Place the larger section on a well-floured piece of wax paper. Roll into a large 12x17-inch rectangle. Carefully flip the dough over onto a 10x15-inch jelly roll pan and peel off the wax paper. Roll the edges under and crimp with a fork. Pour the pumpkin filling into the prepared crust and smooth out evenly. Bake for 35-45 minutes, until its set in the middle when lightly jiggled. For decoration, roll out the remaining piece of dough and use a pumpkin cookie cutter (or leaf shape) to cut out 24 pieces. Bake on a separate baking sheet for 5-10 minutes until golden. 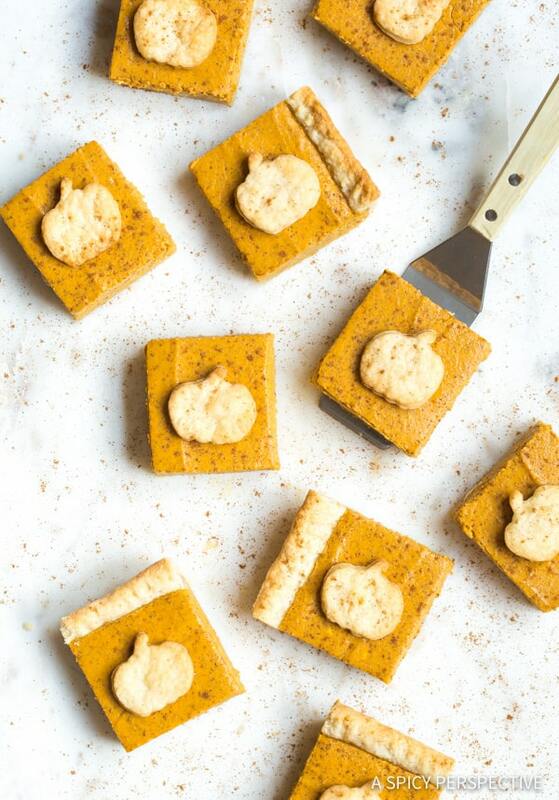 Once the pie is cool, cut into 24 squares and top each piece with a pie crust pumpkin! This pie can be made and chilled up to a week before serving. Cover well. Hi there, in the middle of making this and realized the instructions call for mixing in vanilla but that is not included in the ingredients. Can you let me know how much please. I am hoping a teaspoon. Thank you. Since I was in the middle, I included a teaspoon of vanilla. This was a test run to try it out and YUM, YUM, YUM. 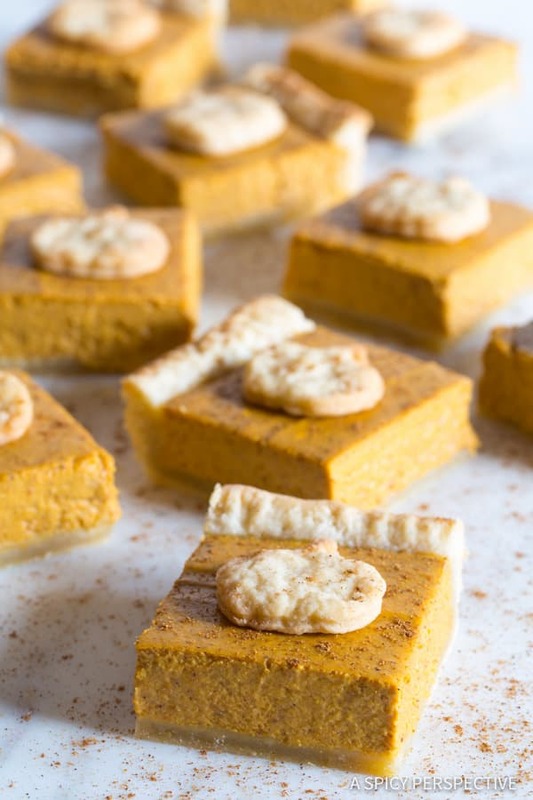 The five spice in place of the pumpkin pie spice is a real surprise….not to mention the cream chesse, scrumptious all around. This is definitely a keeper! Thank you and Happy Thanksgiving! 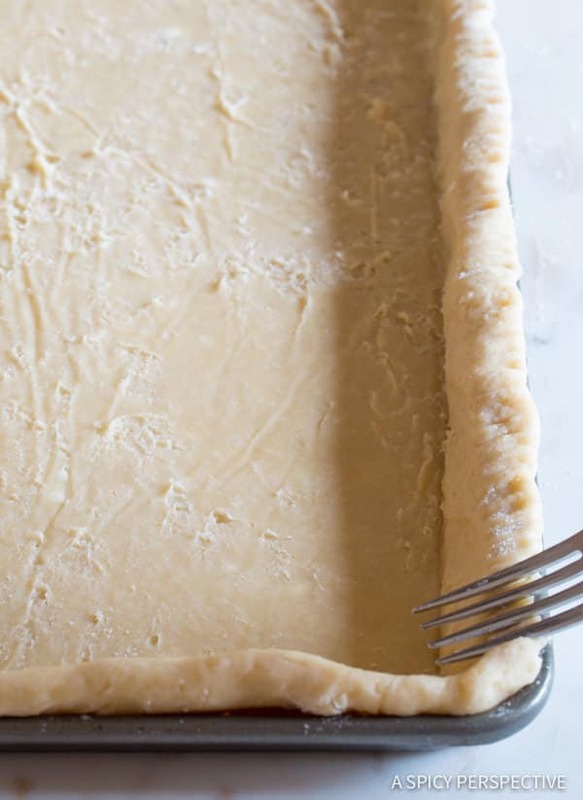 Regarding instructions for the slab pie, an edit is required: “Carefully flip the dough over onto a and peel off the wax paper.” I want to make this pie and wish to be precise on the instructions. Thanks. I see that pumpkin pie spice is listed in the ingredients- would you use the same amount of pumpkin pie spice as Chinese 5 spice (are they interchangeable?)? Thank you! Loved, loved, loved: “until its set in the middle when lightly Giggled ” The ‘Giggled’ made me laugh, and I so needed that today. Thank you, thank you, thank you! I know you said to roll out the dough into 12 x 17 but I could not find what size pan to use. Most slab pies are made in a 10 x 15 jelly roll pan. Thank you so much. I am not being critical, I just want this to turn out for a holiday potluck next month. God bless! Hands down the best pumpkin pie I’ve ever tried! Great smooth texture and wonderful flavor. I love this idea, I always think punkin pie needs more spice , I love where you went with it and can’t wait to try it ! I’m gluten free, would this work if I used a nut crusted bottom instead . Maybe a pecan and cashew crust ? Made this last year for Thanksgiving. Making again this year. EXCELLENT! I used this recipe last year and loved it, but this year I just need round pies, so you have directions for that by chance? I am going to take an educated guess that this recipe would make two 9 inch deep dish pies. Happy baking! 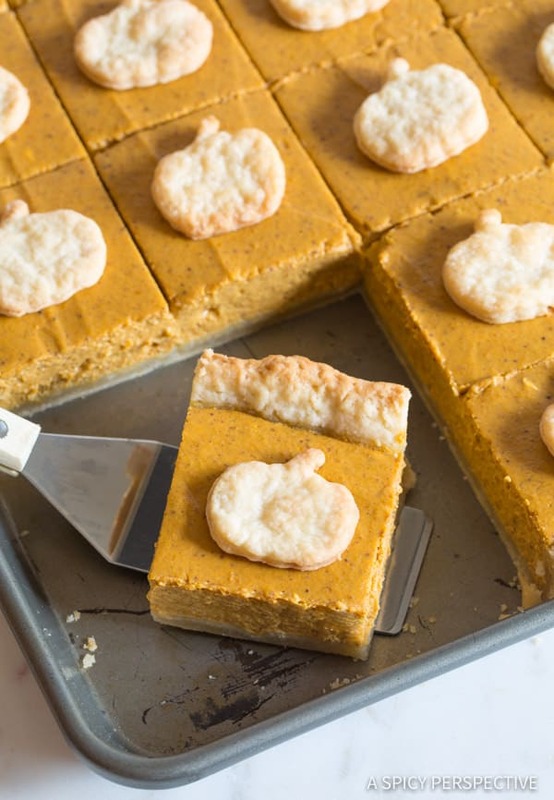 Can you use sweet potatoes instead of pumpkin? I haven’t tried that with this recipe, but in theory, yes! You will need to add in a little extra liquid (cream or milk) because sweet potatoes are so much more starchy than pumpkin. If you try it, let me know how it turns out! I never thought about adding cream cheese! I love the twist you added on this classic pumpkin pie recipe!! 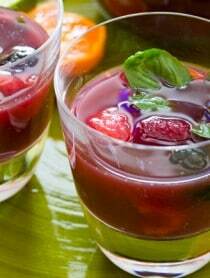 What can you use in place of the amaretto? Oh I love that there is cream cheese in this pumpkin pie! And I’m intrigued to try the chinese 5 spice in it. I think I could eat the whole pan all by myself! How would you suggest turning this into a regular pie? Maybe just cut the recipe in half? The Chinese five spice is a fun idea and I really look forward to trying it out. Normally, slab pies are made with double the crust and 1.5 filling of a regular pie. Looking through the recipe this seems to be the case here too. What a great idea, and so cute! What a great updated version of a pie. it is perfect to bring to a get together. 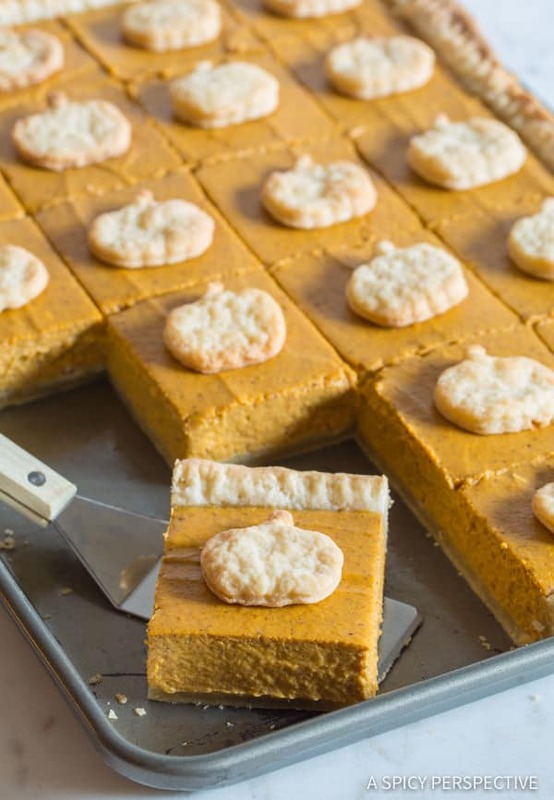 Wow- it’s genius to serve pumpkin pie in a slab like this! Right in time for Thanksgiving. I love the little pumpkins! !.